The Holiday Season may be over but for us- Filipinos, we always have an excuse to celebrate an occasion, to party, to organize a get-together just so we can prepare a special meal for our love ones. And because it is also in our culture to prepare good food, we are also particular when it comes to our recipes and ingredients. Thus, Bounty Fresh Chicken, a brand recognized and trusted by Filipino families as "Asia's best chicken" always comes to mind whenever we want a special chicken dish on our dining table. Coincidentally, Bounty Fresh Chicken brand stands for healthy, nutritious poultry products (fresh chicken, Chooks-to-Go, and processed meats) that respond to various styles of preparation. Another reason for choosing Bounty Fresh Chicken is because of its freshness and its juiciness, thanks to being carefully vacuum-sealed to prolong refrigerated shelf life. 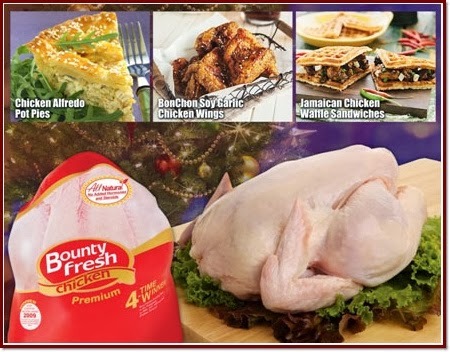 In collaboration with Pepper.ph, Bounty Fresh Chicken shares with us some superb recipes that highlights our favorite chicken. These chicken dishes are guaranteed to whet your guests appetites. 1. In a food processor or spice grinder, place chili, leeks, garlic, allspice and calamansi juice. Pulse to make a paste. 2. Rub the paste all over the chicken thighs and let it sit in the fridge for an hour or two. 3. Grill the chicken until cooked all the way through. Add some barbeque sauce. 4. Place the cooked chicken on top of waffle and add the kesong puti and chives. Cover another waffle wedge and serve. 1. Let pie-crust stand according to package directions. Preheat oven to 450 degrees F. In a large skillet, cook frozen mixed vegetables in a small amount of boiling water for about 5 minutes and drain. Return to skillet and stir in chicken, Alfredo sauce, and thyme. 2. On a lightly floured surface, roll pie-crust into a 13-inch circle. Cut four 5-inch circles and place on top of casseroles. Press edges of pastry firmly against sides of casseroles. Cut slits in tops for steam to escape. 3. Place casseroles in a foil-lined shallow baking pan. Bake, uncovered for 12 to 15 minutes or until done and pastry is golden. Makes 4 servings. 1. Pat dry the chicken wings. Season then dredge in cornstarch. Deep fry until cooked and place on paper towels to drain excess oil. 2. To make soy garlic glaze, combine onion, garlic, soy sauce, mirin, brown sugar, garlic powder, and ginger in a saucepan. Stir over low/medium heat until sugar is fully dissolved. In a bowl, place cornstarch and a tbsp of soy-garlic mixture. Mix to dissolve. Add to saucepan and stir until slightly thickened. 3. Flash fry chicken in hot oil. Place on paper towel to drain excess oil. Toss chicken wings in glaze. Sprinkle some sesame seeds before serving.